Indian Cricket team is doing well on-field during their tour to the West Indies as the men-in-blue is leading the series by 1-0. Along with having a great time on-field, team players are also having fun with their family on the Caribbean soil. The cricketers have been accompanied by their family to West Indies. Social networking sites Twitter and Instagram have been flooded with numerous posts coming from West Indies and the fans are getting multiple treats in form of adorable pictures. 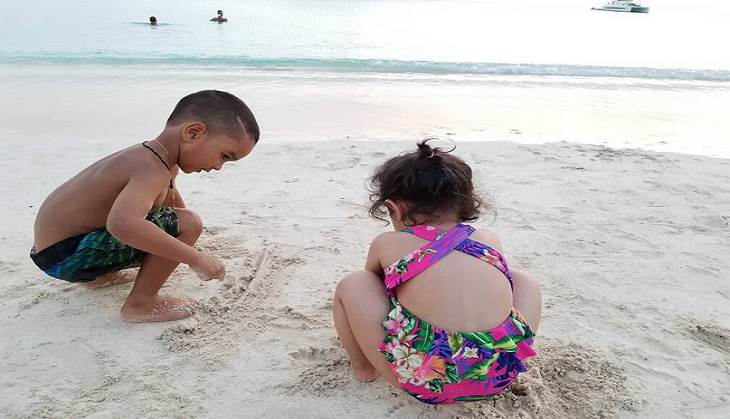 Recently, Mahi's wife Sakshi Dhoni took to her social media accounts and posted another photograph where Shikhar Dhawan's son Zoravar and Dhoni's daughter Ziva can be seen playing with sand. India is currently leading the five-match ODI series 1-0 after two games. The third ODI will be played at Antigua on 30 June.